The chances of a white Christmas are definitely increasing. We’ve had a couple of snow showers that haven’t melted due to the freezing cold but this weekend is shaping up to be the first major storm of the season. The kind where we need to make sure the snowblower fires up and we have enough fuel for it. The major weather sites are just saying snow but the local weather sites are saying it could be 6-12″. The kids will be thrilled! They love snowball fights. 🙂 Fortunately it will be over the weekend so no worries about commutes. We can stay off the roads. Our turkey is about done now and it’s time to make some stock with the bones. That will be on the list for today. 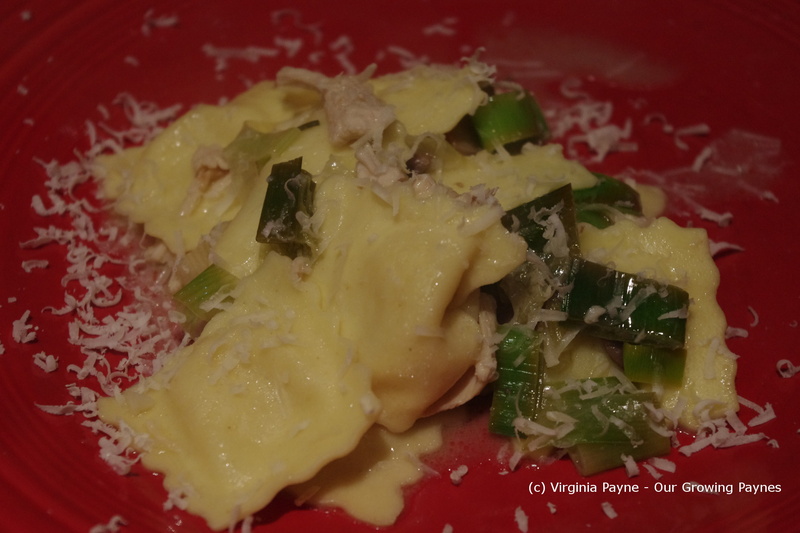 One of the dishes I created to use up the turkey was this dish that went over pasta. It was a school night so it needed to be quick. 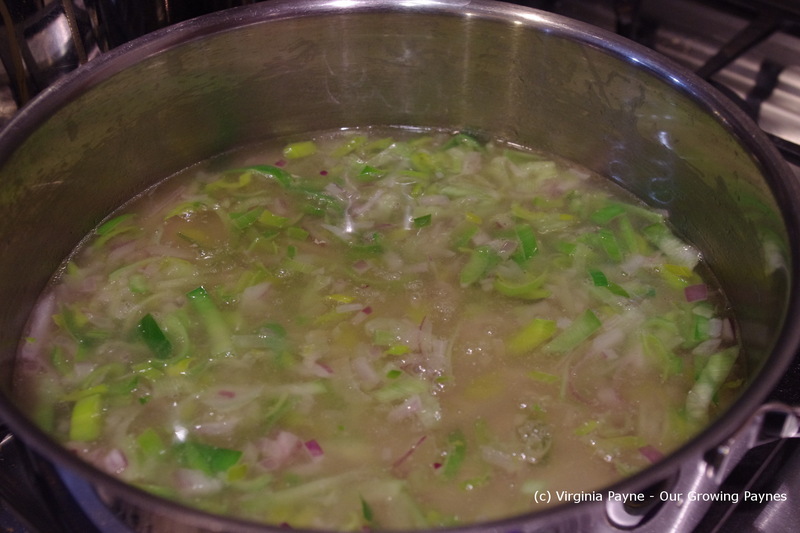 We are lucky enough to still have leeks in the garden, granted they are frozen but we can still use them. This meal takes less than half an hour to throw together. 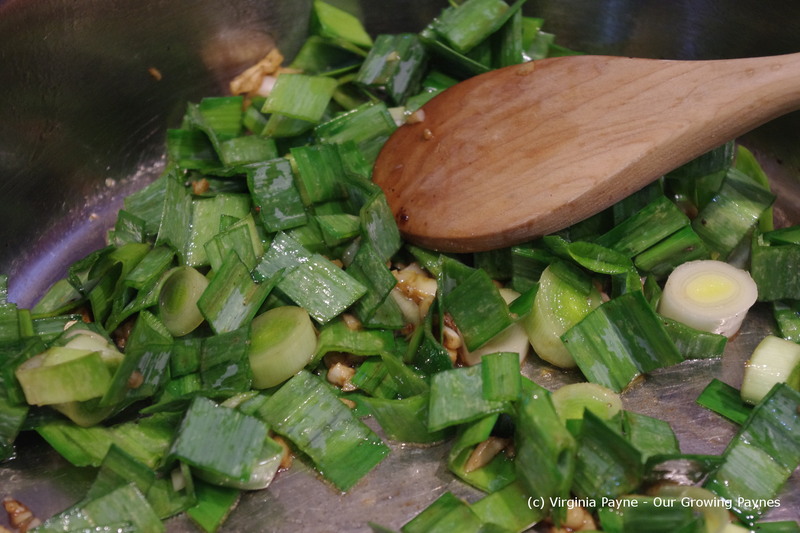 To prep slice and clean the leeks and drain. 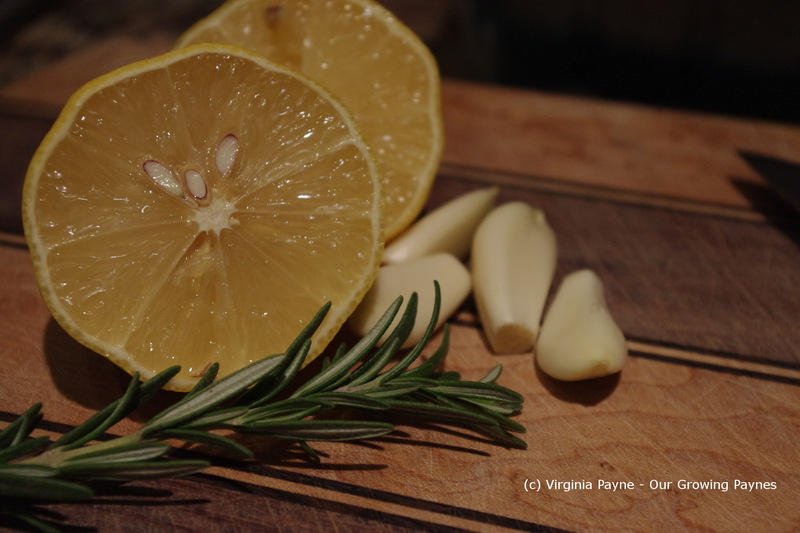 Chop some fresh rosemary and garlic and squeeze the juice of a lemon. 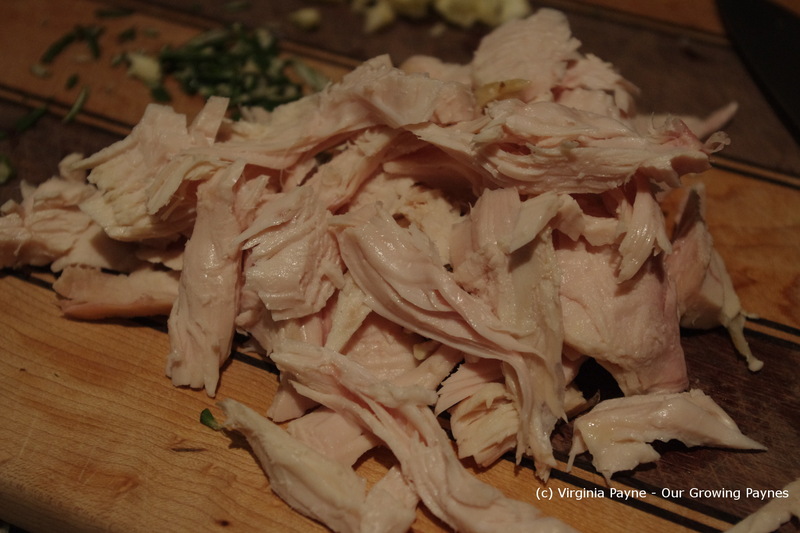 I then cut what I needed from the turkey into small pieces. I also sliced some mushrooms. 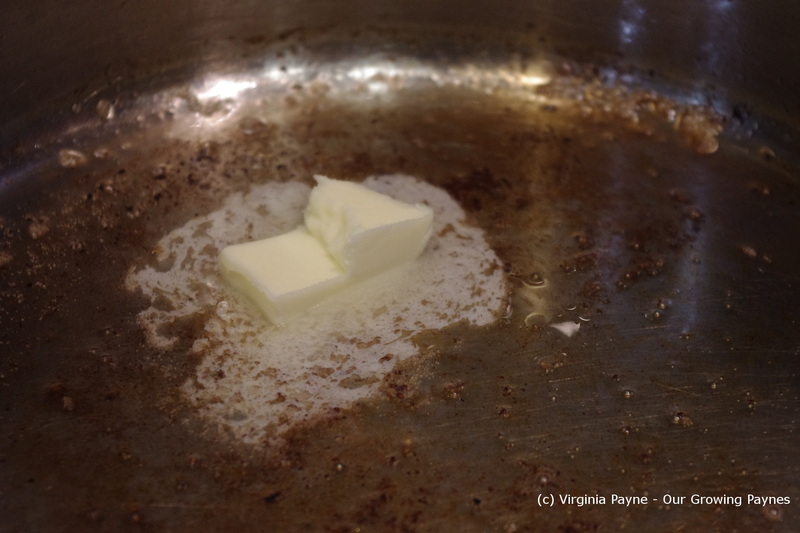 In a skillet I put a bit of olive oil and then a couple of tablespoons of butter to melt. 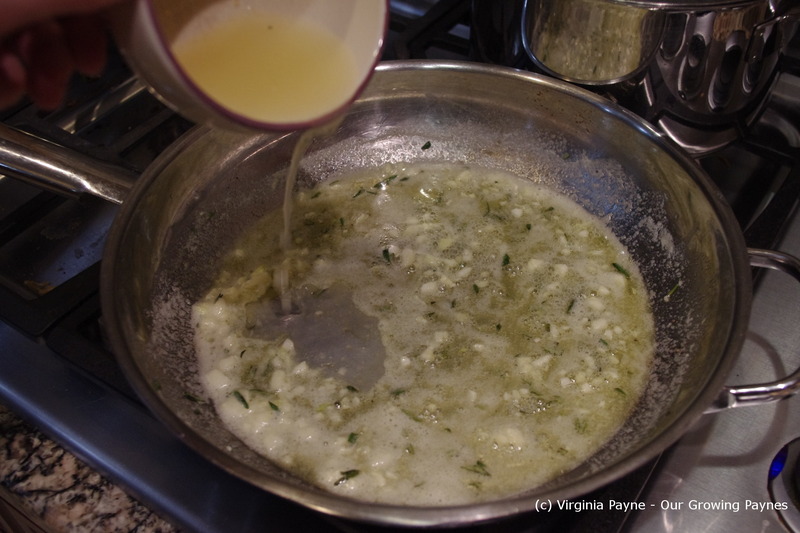 Add the garlic and rosemary with the heat on low and cook for several minutes to allow the flavours to infuse together. 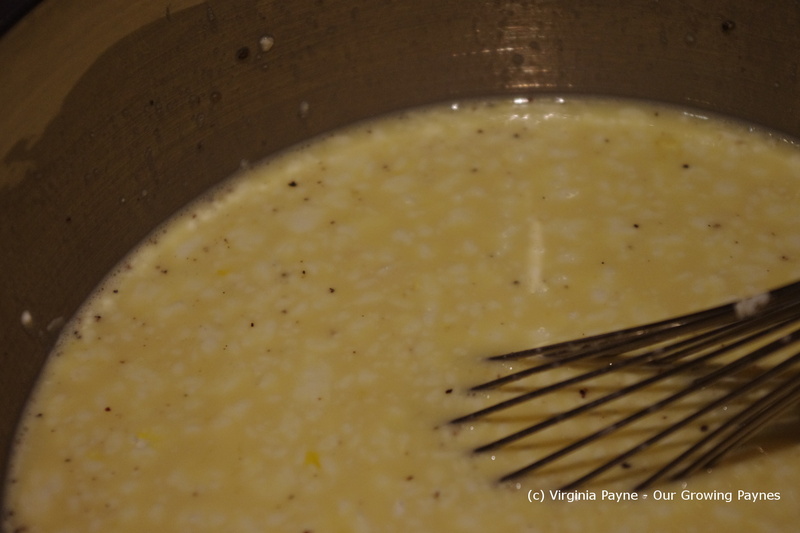 Start with about half the lemon juice and add that to the skillet. Later add more lemon juice to taste. 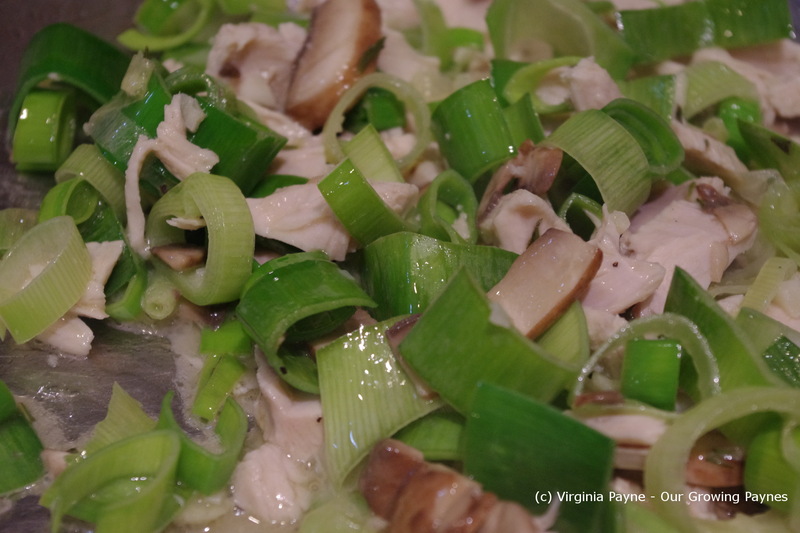 Add in the turkey, leeks, and mushrooms. In the meantime cook up the pasta of your choice. I chose cheese ravioli for this pairing. Once everything is cooked serve with grated cheese. 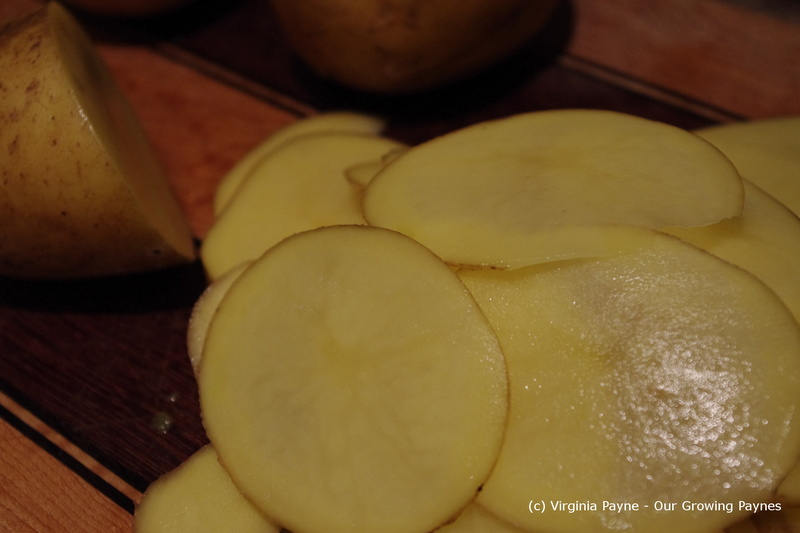 It had a light flavour with the lemon and was delicious with pinot grigio. I think this weekend we’ll be doing more stick to your ribs food with the storm and cold. Comfort food will be key! I don’t know what my expectations were for the food on the ship. I don’t think they were high or low but maybe just hopeful. We enjoy good food and it’s part of our experience when we travel or just live. Overall it was fair to middling but I did get some inspiration here and there to try at home. One starter my husband ordered was a goat cheese and leek tart. I had a small bite and thought I could come up with something that we’d all like. We got back home late Tuesday night after a nearly 20 hour day of traveling. Now you would think that would mean we needed a good long sleep. Oh no. Bright eyed at 4am. Why? The only good thing was we managed to get a ton of stuff done before 7am. Unpacked, laundry started and all! Picking up the dogs is always an adventure after a trip. They love the kennel and get excited when we pack their things but they are equally excited to come home. They barrel down the hallway leaping about like idiots. Trying to get the harnesses and leashes back on them is like wrestling an octopus! Then the day dragged as we had to wait until school was over to get the kids. We missed them so much! I wanted to do a home cooked meal for them but I needed something simple as I knew by the time dinner needed to be made I would be struggling to keep my eyes open. 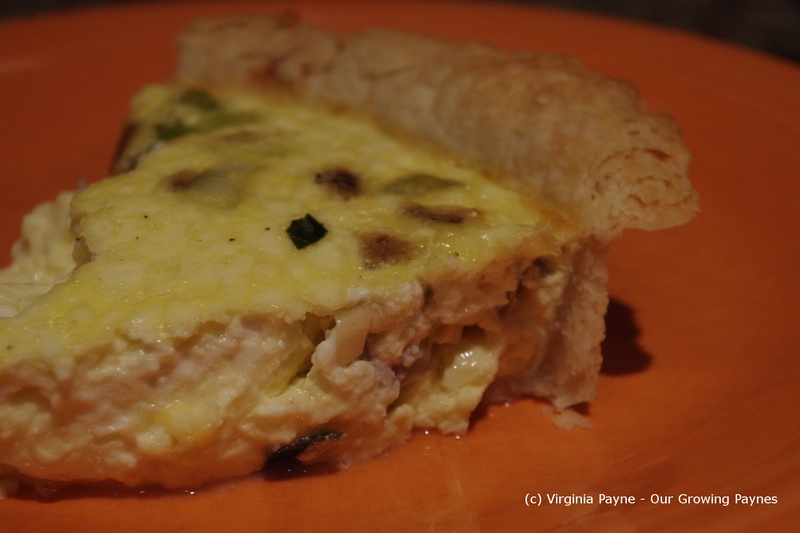 This quiche would do the trick. I prepped the veg first. 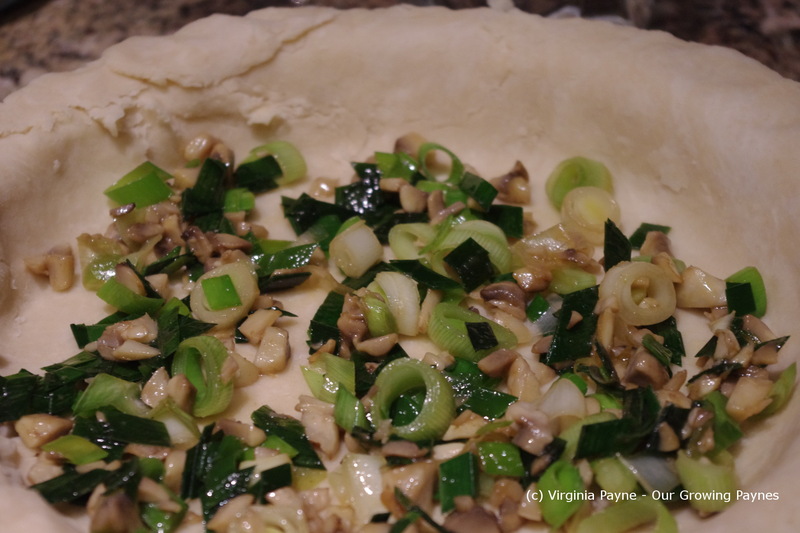 I chopped several mushrooms, couple cloves of garlic, and a small leek from our garden. And sauteed them in some olive oil. 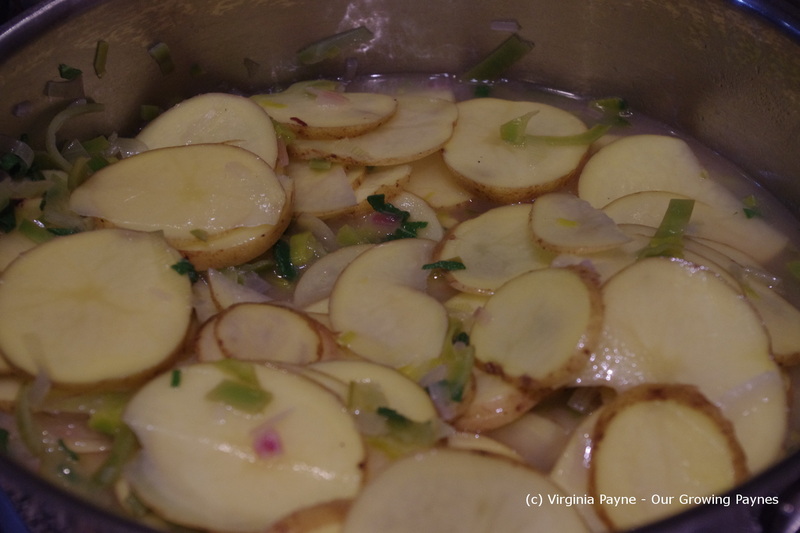 As they soften I added just a smidge of veg bouillon and a few splashes of water to the mix. In a small bowl I prepared the rest of the mixture. 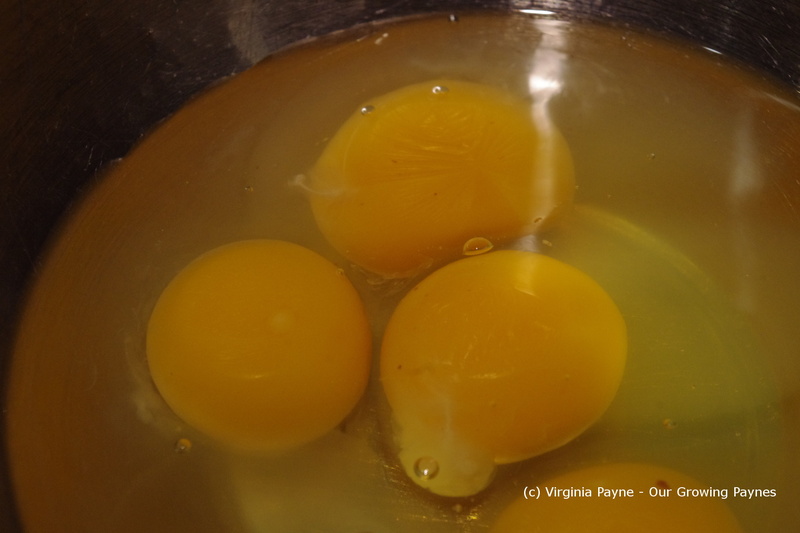 Mix together 4 eggs and two cups of milk. We use 2% milk and that works just fine. 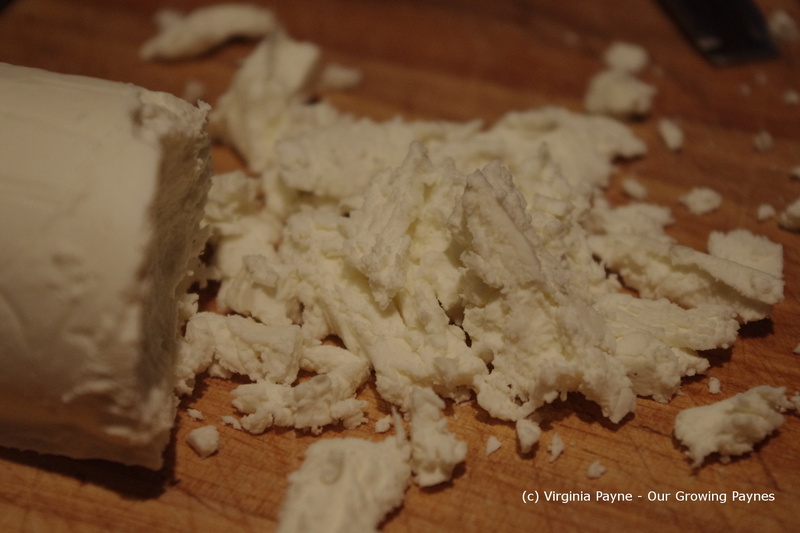 I crumbled up 4 oz of soft goat cheese and added it to the egg mixture. 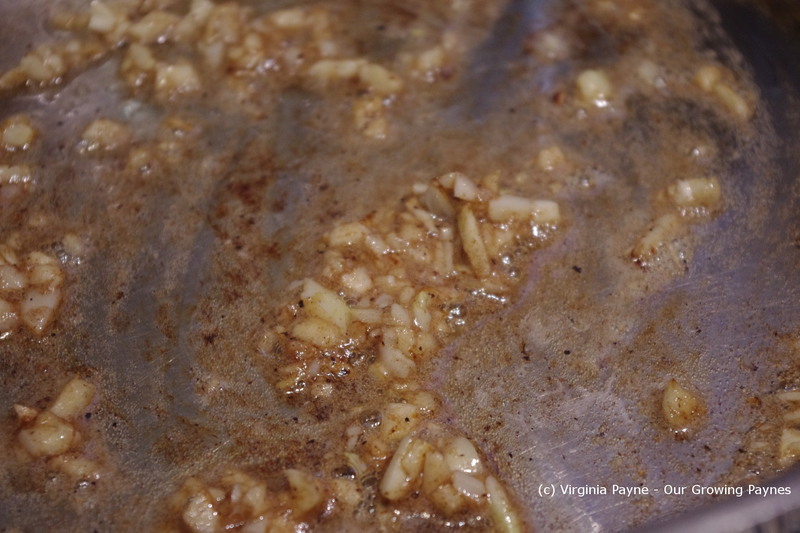 To season salt and pepper to taste and add a few teaspoons of Worcestershire sauce. 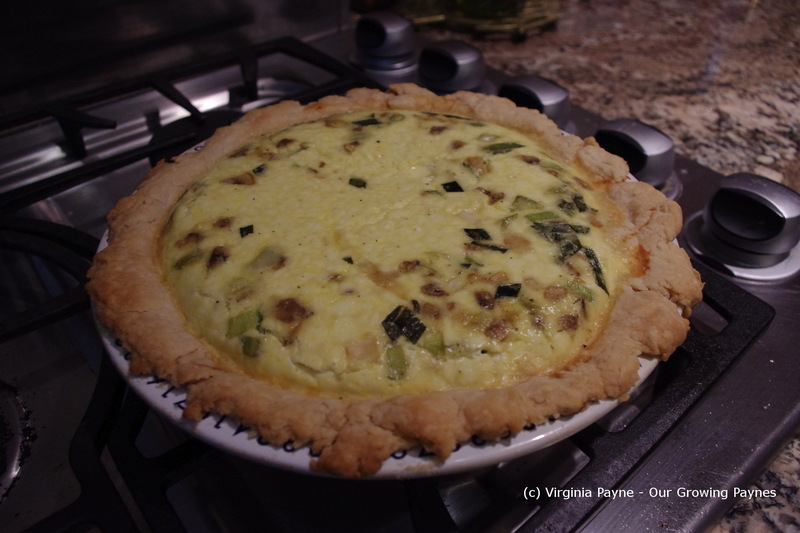 Set this aside and make the pastry dough for the pie shell. 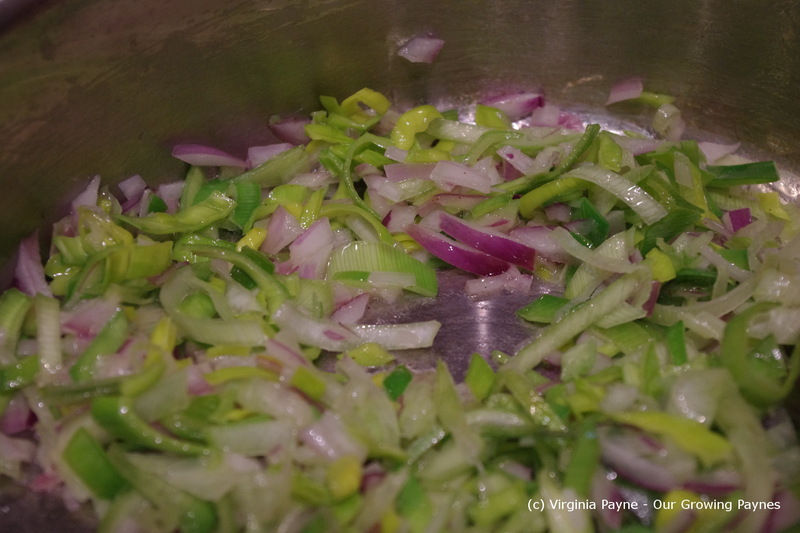 Spoon in the leek mixture and spread along the bottom. 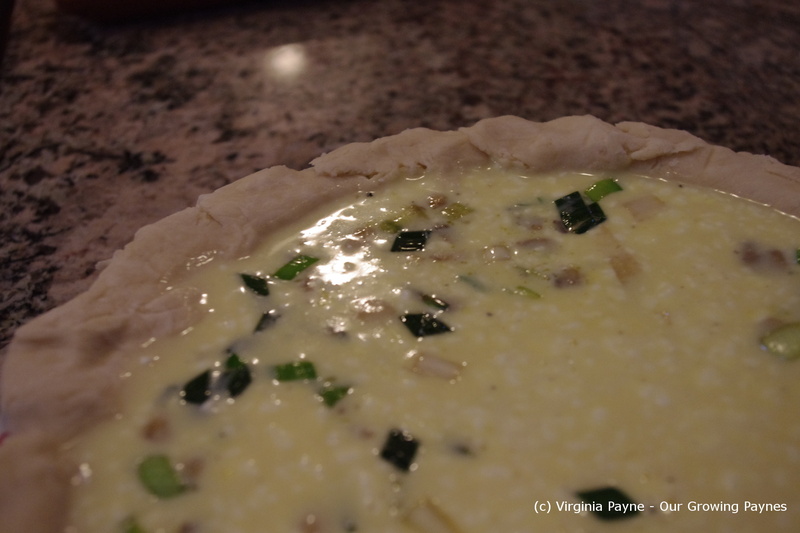 Pour in the egg mixture on top and bake for 15 minutes. Reduce the heat to 350F/175C and bake for another 30 minutes or so. Until the toothpick test comes out clean. If you are not jetlagged, hungry, and wanting a pillow let it set for 5-10 minutes. I barely made it 5 before I was ready to serve so it was a bit soft but the flavour was there. This was perfect comfort food after a very long day. But it was wonderful to have a sit down dinner with the kids again listening to how their day went. I missed that. I’ve mentioned a few times this year that the garden has been a bit wonky. The growing aspect has been all over the place. The leeks are no exception. The previous years they have grown to be about 5 feet long and almost 3″ in diameter. Loads of meals but this year they are about 2 feet and about an inch in diameter. And we didn’t do anything different! Fortunately the flavour is still there. So I thought they would go well with the duck. To prep I sliced and cleaned the leeks. Dirt gets in all the crevices of those little buggers! Next I score the fat on the duck and season with salt and pepper. 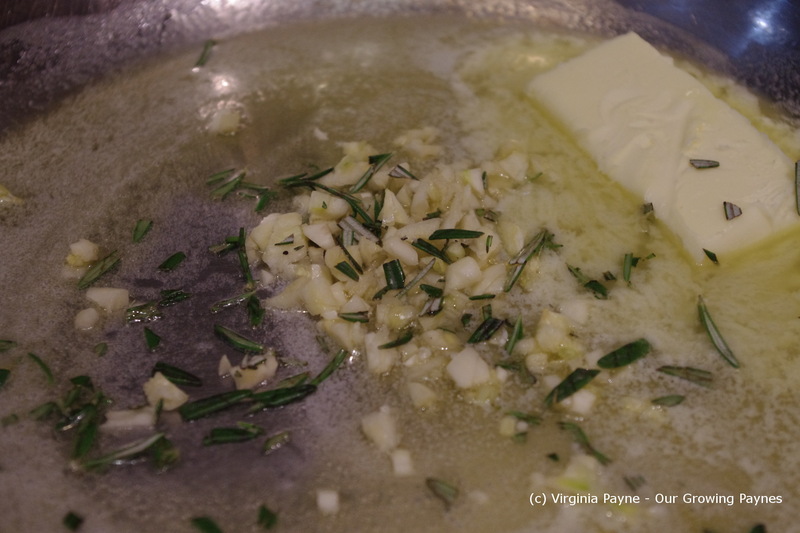 In a hot skillet I place the duck fat side down. 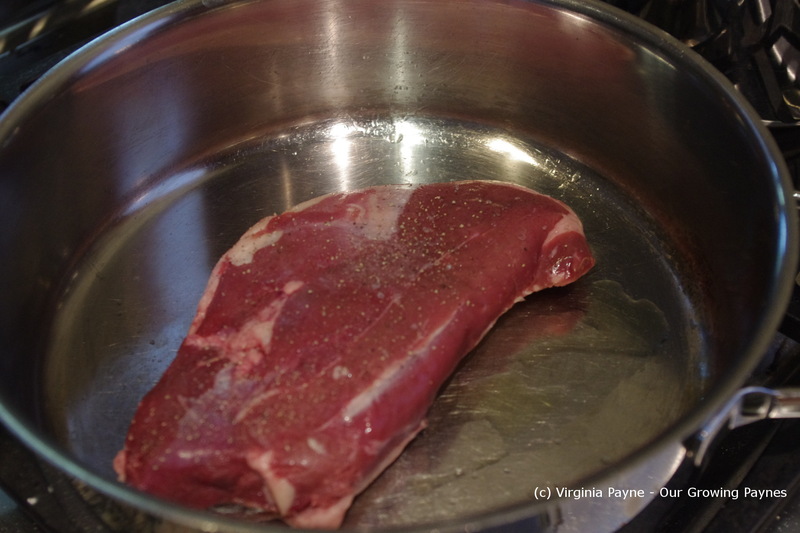 Once there is a bit of a sear I turn the heat down to slowly render the fat. 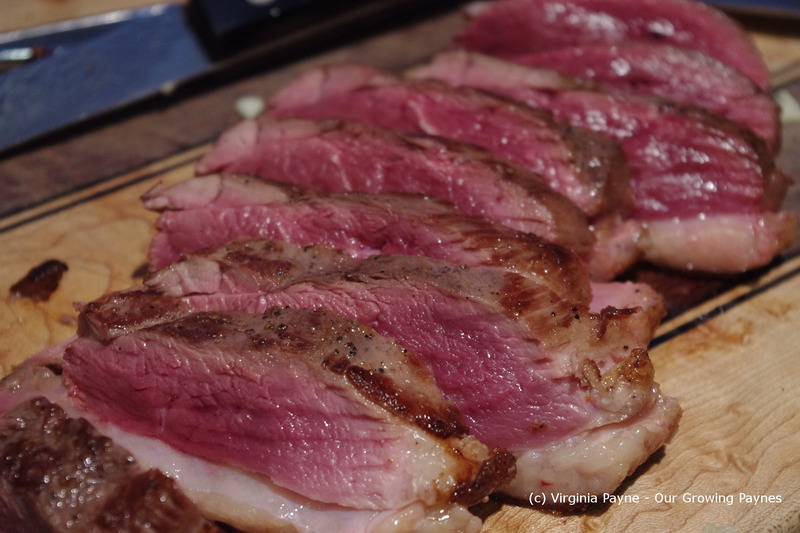 Once it’s rendered enough turn and sear the meat side. Do this for the short sides as well so you’ll have to hold it with tongs. 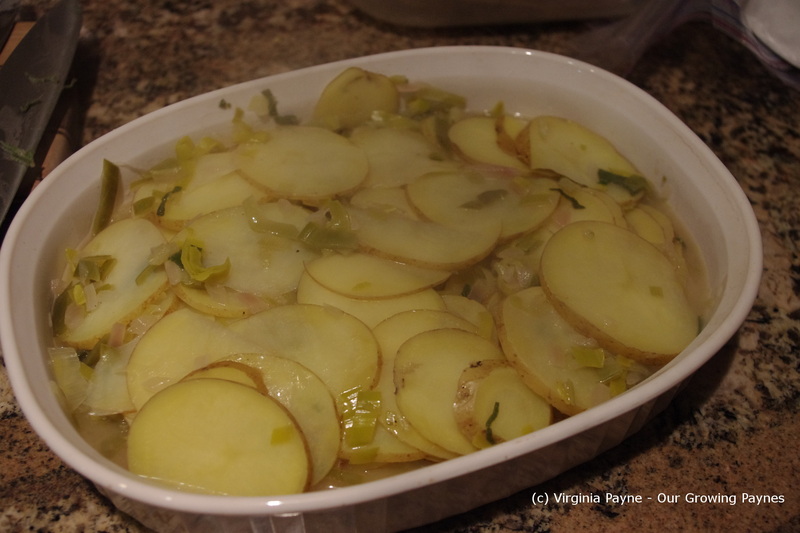 Remove to rest and keep it warm while the leeks are being cooked. 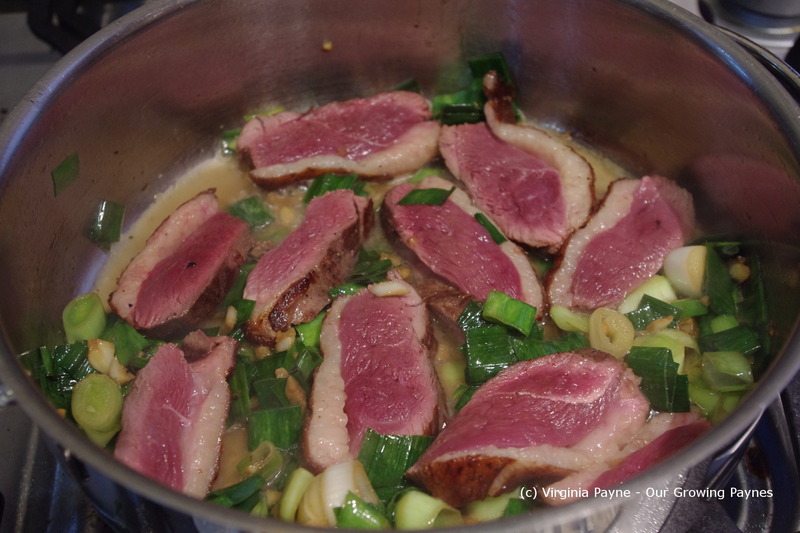 Next I drain about half the duck fat otherwise it would be overwhelming. I add about a tablespoon of butter to melt. 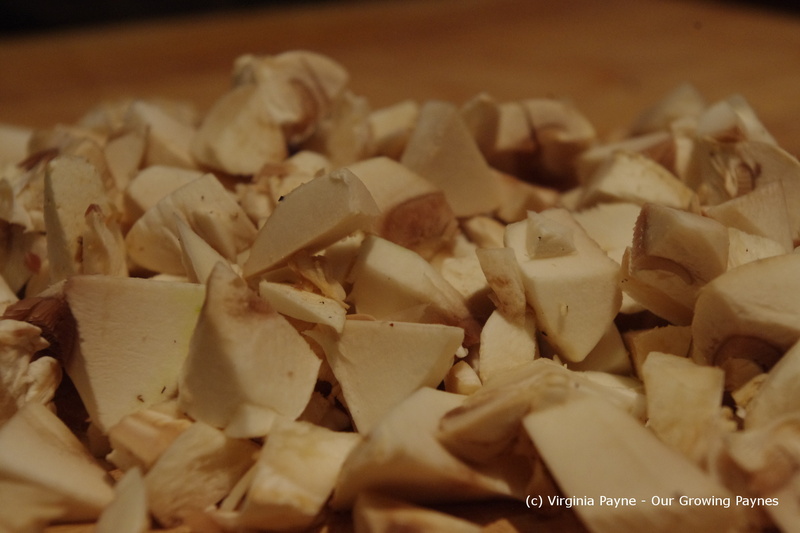 I chopped up about 4 cloves of garlic and sauteed them until they started to turn a little golden. 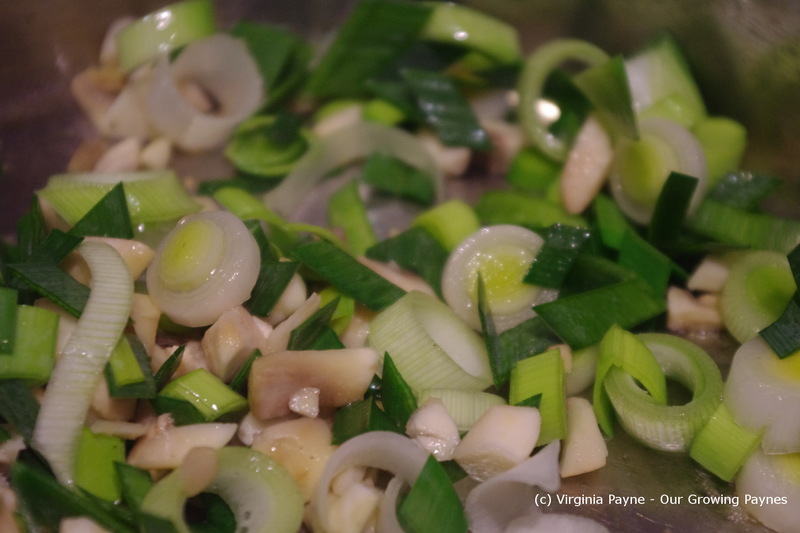 Toss in the leeks and saute until cooked. While this cooks I slice the duck. This particular duck was a bit stubborn as it stayed on the rare side. 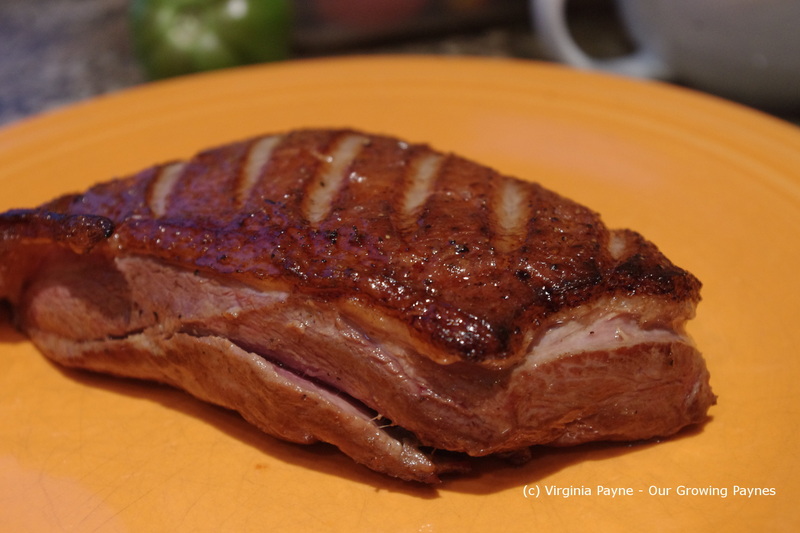 Easily fixed as I added the duck to the skillet with 1/2 cup of Pinot Grigio and simmered for a couple of minutes to reduce down and to just finish off the duck. 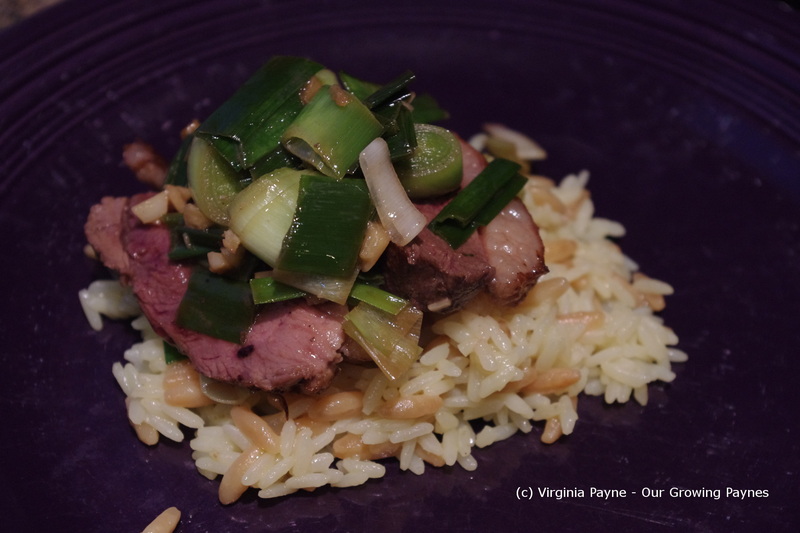 I cooked up some rice pilaf and served the duck and leek over the rice. Got a thumbs up from the kids. And the dogs were thrilled because they got the excess duck fat. Happy campers all round! 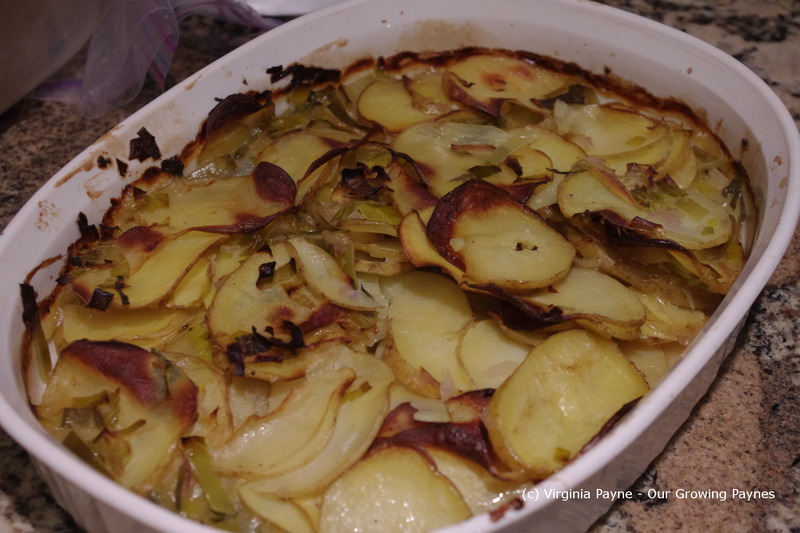 The other day I had the grand plan of recreating a dish I had in Paris. It was an unmitigated disaster. 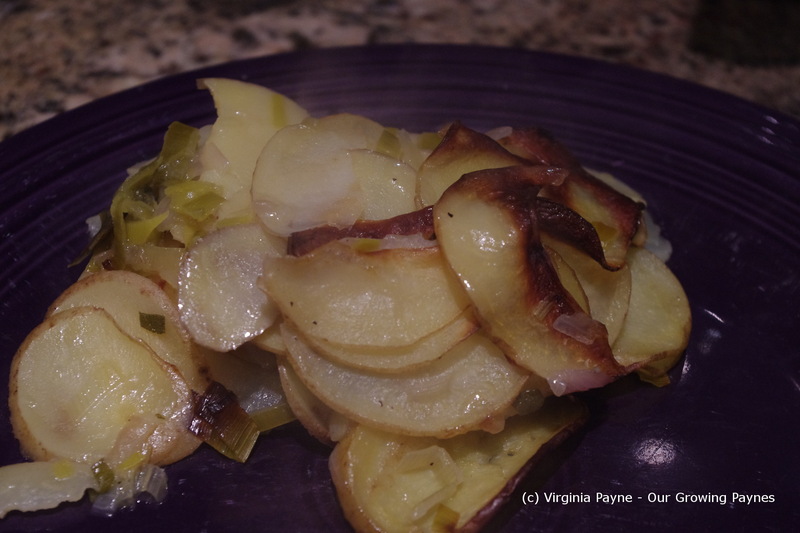 The key ingredient was the artichoke. I had never prepared one before and I may never again. The dish was a lovely tender bottom half of an artichoke with amazing smoked salmon, a poached egg, and a mustard sauce. The last three I was able to do. However we now have a pot that is blackened and I’ll have to attack that with oven cleaner. I hope that works. I was steaming the artichoke and it ran out of water. Sigh. So I moved on to other things. I decided it was time to get the leeks and onions into the ground. We like to rotate our little crops each year and that was the plan for the leeks and onions. Mother Nature had other plans as one bunching onion plant is regrowing and some seeds that didn’t sprout last year are coming up now. Which is pretty cool but that bed is staying the same as last year. 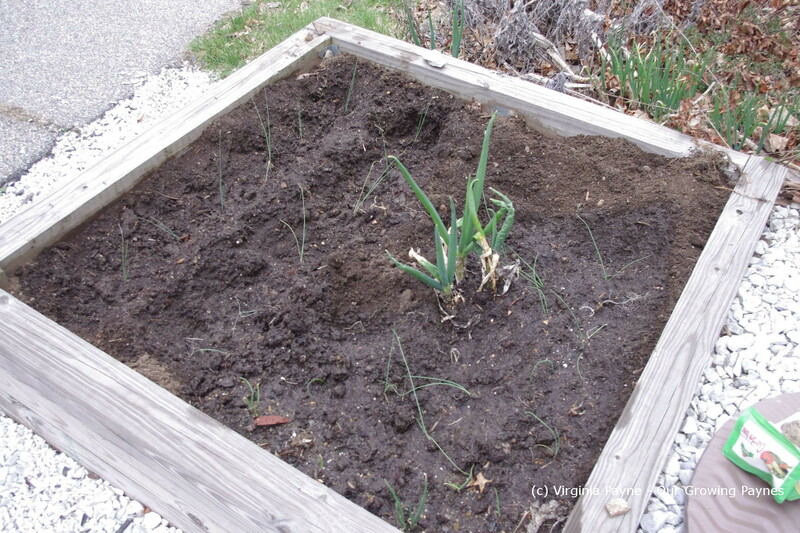 For the leeks I dig out two small trenches to plant them in and mix in organic compost and fertilizer. 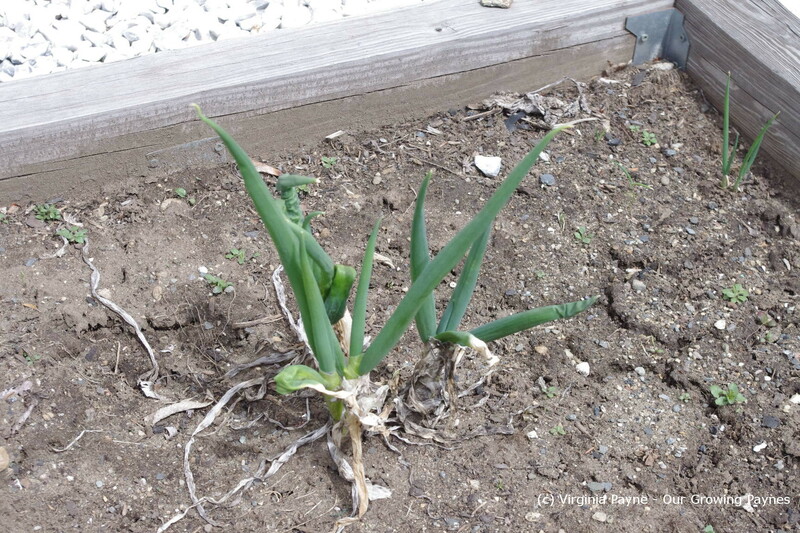 A lot of gardeners will bury the leek as it grows to blanch it. 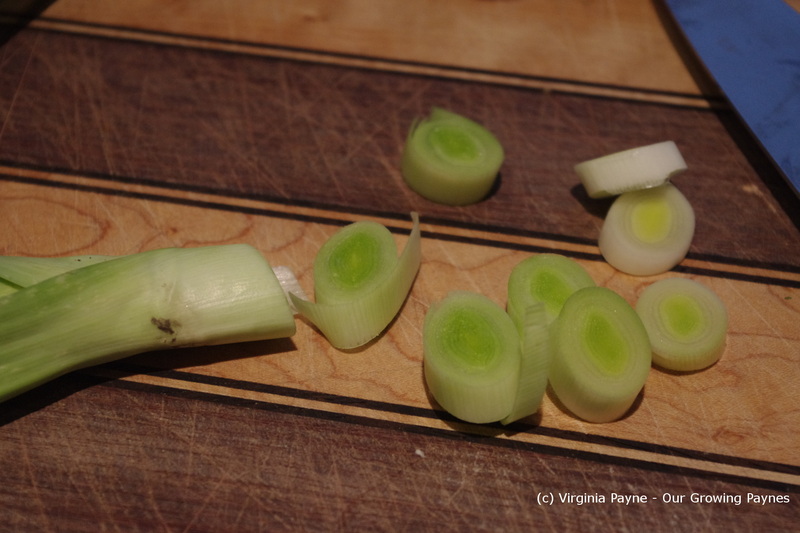 I only do that a little bit until the leeks are pretty sturdy as I like the dark green. More flavour. 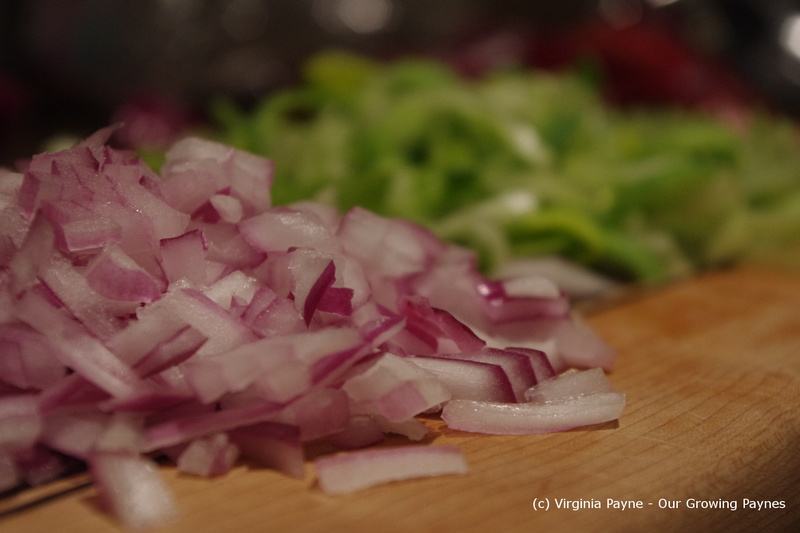 The bunching onions are much easier. After mixing in the compost I just plug them in willy nilly. 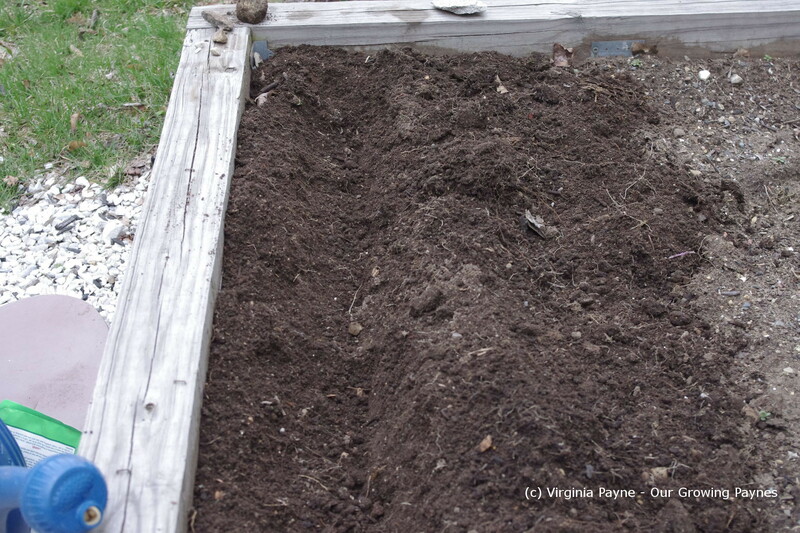 I left space to plant more seeds in a few weeks to stagger the harvest. Our garden is well on it’s way now with the bulbs and flowers starting to grow. The peas are poking through and I think spring is finally here to stay!